Each year the International Plowing Match and Rural Expo (IPM) grows out of farmers’ fields. As part of the stewardship of the IPM, we ensure the land is returned to its original condition when the event is complete. This wonderful legacy does present some accessibility challenges to overcome – for example, streets are soil and can be uneven – but we work hard to make sure everyone feels welcome and safe so they can enjoy the IPM. All mobility scooters (personal and rented) are permitted at the IPM. Med-E-Ox Mobility in Motion will have a number of scooters to rent at the IPM. We encourage you to contact Med-E-Ox Mobility in Motion in advance to reserve a scooter and avoid disappointment. Reservations can be made by calling 1-800-265-5500 ext. 208 or 203. After September 17, call 519-841-7734 or 519-525-1111 for all inquiries. Working service animals are permitted. 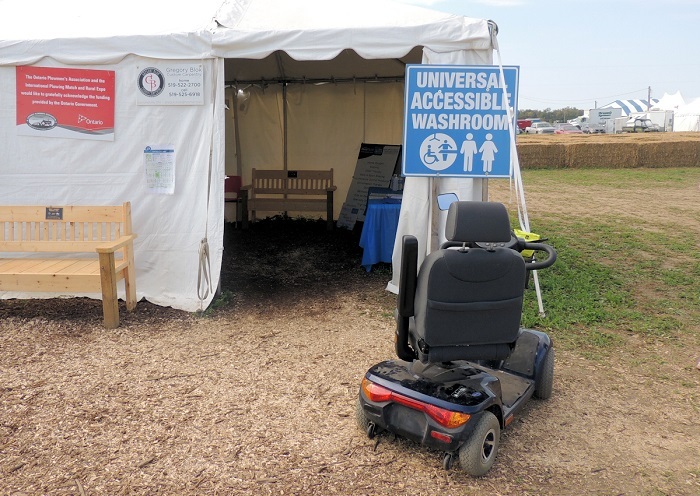 Service animal rest areas and water bowls are located throughout Tented City at all Universal Accessible Washrooms and in the Education Area. Two qualified ASL/English Sign Language Interpreters will be scheduled at events in Tented City on Tuesday, September 18 and Saturday, Septenber 22 from 9 am to 5 pm. We welcome everyone to attend and enjoy the IPM.